As the United States emerged from the War of 1812 it turned its attention to the western frontier. To open the Great Lakes to commerce and settlement the government oversaw construction of the Erie Canal in New York. The Canal would result in increased maritime traffic and the government knew the next logical step was to build lighthouses on Lake Erie. To this end Congress appropriated $5,000 in March 1819 and an additional $5,000 in May 1820 to build a lighthouse at the northern end of the Marblehead Peninsula at the entrance to Sandusky Bay in Ohio. Four acres of land were purchased for $300 on the Marblehead Peninsula in 1821. A contract calling for a 50 foot stone tower was signed and construction began in September. 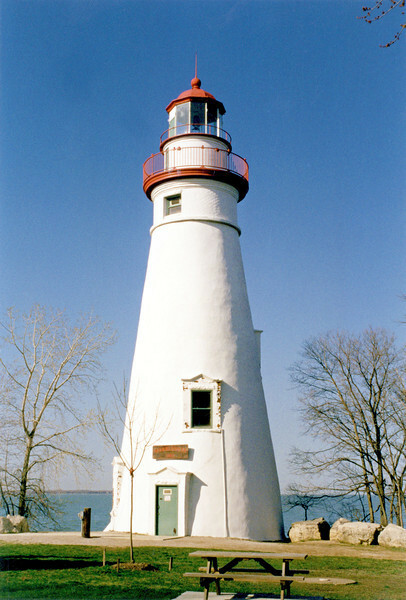 William Kelly, the area’s first mason, oversaw the construction of the Sandusky Bay Lighthouse and the Keepers dwelling, both of which were constructed with local limestone. The work was finished in November; however the tower remained dark since the lake’s navigational season has ended.